Are you looking to step your pooch’s style game up without breaking the bank? If so, this is the list for you! Below you’ll find what we think are the top five designer dog collars that you can buy online in Australia. In addition, we included some replicas (not fakes or knock-offs) that are an alternative to the much more expensive collars. They feature a similar style but without compromising quality, durability, and of course – trademarks! Gucci is famous for its handbags, scarves, jewelry, cosmetics, and now you can even add dog accessories to that list! 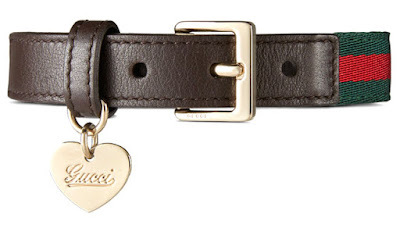 The original Gucci dog collar features the signature web with brown leather trim. It comes with a heart shaped light gold dog tag and hardware. The stylish Gucci collar is completely handmade by artisans in Italy. Louis Vuitton is known for their beautiful designs, and that includes collars and leads! 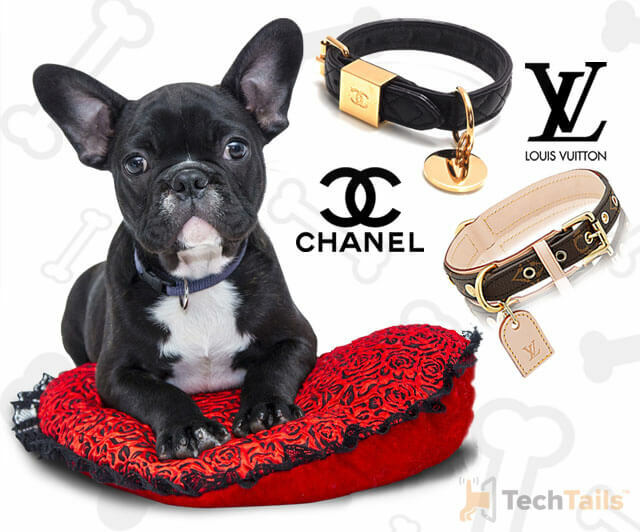 Louis Vuitton has even designed dog collars to match their luxurious handbags and accessories. 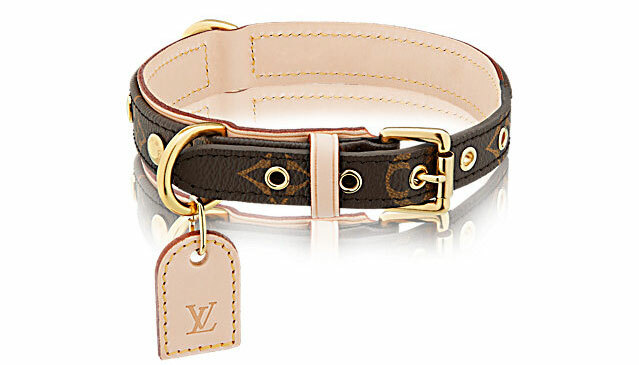 This authentic Louis Vuitton dog collar by Baxter features the famous LV monogram canvas and a natural cowhide leather backing. It also comes with a Louis Vuitton leather dog tag which can be laser engraved. These Hi-Tech LED collars light up with a push button. They are USB rechargeable and offer more than seven hours of continuous use with a single one hour charge. They are made from a durable nylon webbing and flexible fiber-optic technology. 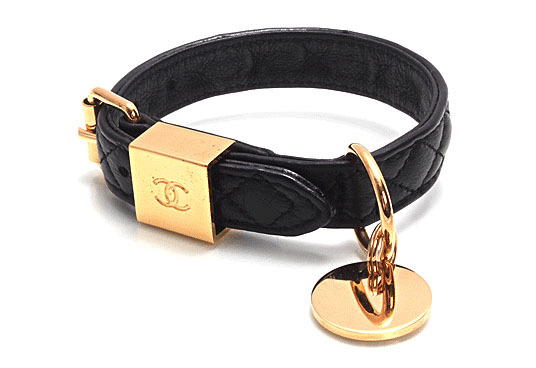 The Chanel dog collar, an exclusive of Neiman Marcus, features a unique black leather with Chanel's pattern. This fantastic collar is hand crafted of the finest Italian leather and adorned with golden metal alloy and solid brass. The clip is made of gold toned metal with Chanel engraved on one side, along with a mark of "Made in Italy". If you are searching for a slightly subtler look, the Burberry dog collar is the perfect match for you. This beautiful, high quality collar demonstrates outstanding craftsmanship and beauty without calling attention to itself. The Burberry collar features a Nova Check Haymarket coated canvas and the famous Burberry plaid. 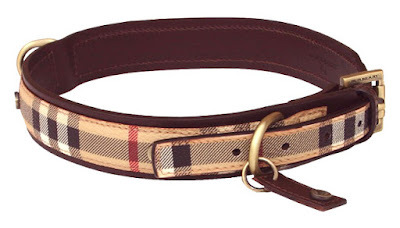 If you already a fan of Burberry accessories, then why not get a collar for your pup too! 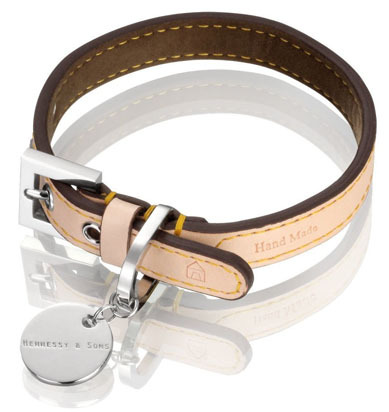 The designer dog collars by Hennessy & Sons are made from a hand-made vegetable leather and is tanned ecologically. Its metal components are high-quality stainless steel. Hennessy & Sons even donates 2% of their annual turnover to the International Animal Rescue Foundation. 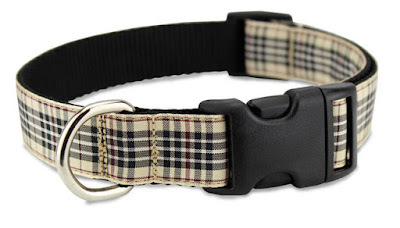 The Furberry dog collar features a similar Nova Check/Burberry coated canvas and pattern. The original Burberry collar used to cost around AU $320 but it was discontinued a couple of years ago. Now you can buy the London Furberry for just $18 on Amazon. Style has been accessible at the tip of our fingers since the dawn of the internet. Even then, it’s still a pleasant surprise that now style for dogs has become so readily available as well. Whether you choose to match your furry best friend or just want to make them the prettiest in the pack, designer dog collars should definitely be on your radar!